A new rendering of Hyundai’s all-new IONIQ hints at the looks of the alternative-fuel compact vehicle, which is due for launch in early 2016. Hyundai has confirmed that the IONIQ will be the world’s first car to offer a choice of three ultra-low-emission powertrains: full electric, plug-in gasoline / electric hybrid, or gasoline / electric hybrid. With a sleek, coupe-like silhouette, Hyundai says the IONIQ will deliver a fun and responsive driving experience, while also meeting the needs of those wishing to reduce the impact their motoring has on the environment. At the front, it sports the familiar Hyundai hexagonal grille, topped by a gloss-black element that extends outwards to meet new headlamps featuring integrated ‘C’-position lights. Inside the IONIQ the smooth, clutter-free theme continues. A clear, logical approach has been applied to the layout of control functions, with simple surfaces that make use of eco-friendly materials to convey, says Hyundai, ‘a futuristic yet warm cabin ambience that will appeal to a new generation of motorists’. 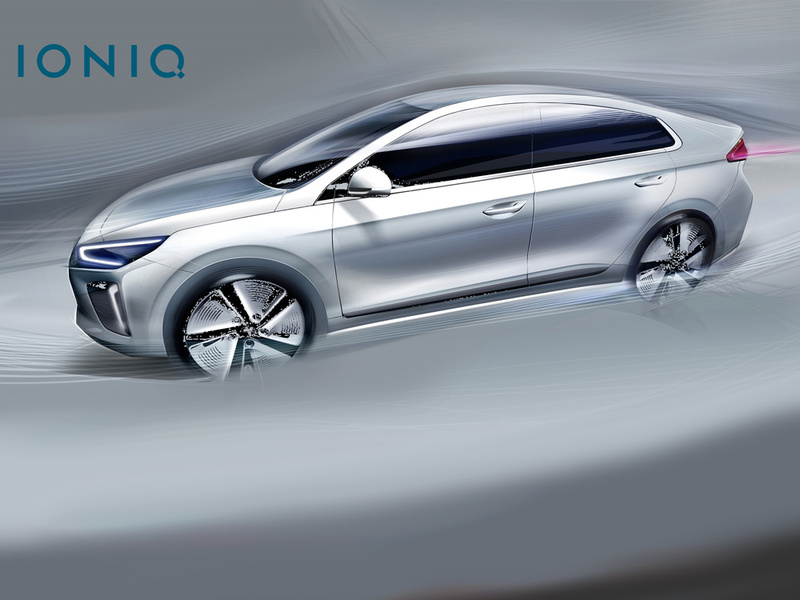 The IONIQ’s name references elements of its creation. An ion is an electrically-charged atom, linking to the car’s clever combination of electrified powertrains. The ‘I’ is said to reference the ‘unique offering it brings to the Hyundai range, demonstrating the brand’s environmental commitment and willingness to maximise choice for its customers’. Finally, the Q is depicted in the car’s logo as a visual breakthrough, acknowledging the fresh new approach of this advanced, low-emission model. Following a world premiere in Korea in January, the IONIQ is due to be shown during March 2016 at the Geneva International Motor Show and the New York Auto Show.